I moved to Helsinki in 2017 from Brighton in the UK but I grew up on the Isle of Wight, a small island situated to the south of England. Having always lived by the sea, I have grown to love and respect the water, which is why Saimaa inspired me so much. To me, lakes possess a uniquely calm and reflective atmosphere and that is what I wanted to portray in my poster. I began making visual art when I was studying for a degree in digital music and sound art. As part of my dissertation I created a mixed-media stop motion animation alongside the music and sound design. This is when I really fell in love with combining traditional hand made art with digital, and from then on I have always tried to keep some element of my work handmade. We’re bringing new life to poster art! 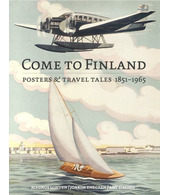 Beth Chesser is a part of Come to Finland’s effort to create a renaissance for the almost forgotten genre of poster art. Make reality of your own, or your business’, poster idea through Come to Finland. Mail us at posters@cometofinland.fi – together we’ll let creativity flourish!